C's more likely to win the division or miss the playoffs? For the second night in a row the Celtics knocked off the team immediately behind them in the Eastern Conference playoff standings (first the Cavs on Tuesday, then the Bucks on Wednesday). And even though Boston is tied with New York for the 7th/8th playoff spots, they're now 3.5 games ahead of both Cleveland and Milwaukee, but only 3 games behind Philly for the Atlantic Division lead and the 3rd seed in the East (with 2 of their next 4 games against the Knicks and Sixers). On Wednesday against the Bucks Garnett filled in at center and looked as good as he has all year, putting up a season high 25 points, and 10 rebounds. It marked the first time since the 2008 Championship season that he's scored 18 or more points in four straight games. He also went 4-4 from the free throw line in the last 14 seconds to ice the game (for the season he's shooting a career high 86% FT, second best on the team to Ray's 92%). With Jermaine O'Neal out, Brandon Bass took over Garnett's power forward spot. I love this lineup, and I really hope Doc keeps going with it. If KG can outplay Dwight Howard in back to back games, I'm pretty sure he can hold his own at center against the rest of the Eastern Conference. After going 1-5 in the previous six games that Bass missed, the C's are now 2-0 since his return. Obviously I'm not saying that's the reason they lost five in a row, but I do think there's a slight correlation. Wow. That is some list. 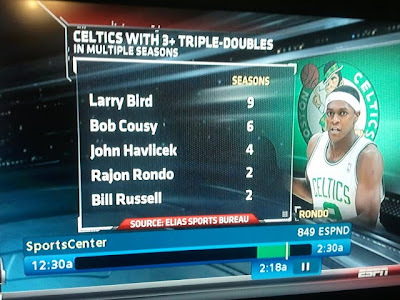 I REALLY hope they don't trade Rondo. My official plea to Danny Ainge is coming soon. Oh, and back to the title of this post, I still think they can win the division. "You not say Ukraine weak!"